Sengnouane Xayalath, who is also Secretary of the Lao People’s Revolutionary Party Central Committee Secretariat, expressed his delight at the growing special solidarity between the two countries while appreciating the enormous, timely and effective assistance Vietnam has given to Laos throughout history. He briefed his host about recent activities of the Lao NA, particularly the outcomes of its fifth session, cooperation between the two parliaments, and the outcomes of the talks and working sessions with representatives of the Vietnamese NA. The Lao NA will coordinate closely with its Vietnamese counterpart to effectively carry out the agreements reached by leaders of the two Parties, countries and National Assemblies, he added. General Secretary Trong welcomed his guest’s visit, noting with satisfaction that the special solidarity has been developing in a result-oriented manner in all spheres, an achievement greatly contributed by the two NAs. He spoke highly of the two legislative agencies’ cooperation, asking them to enhance sharing information and experience in making law, supervising and deciding important issues. 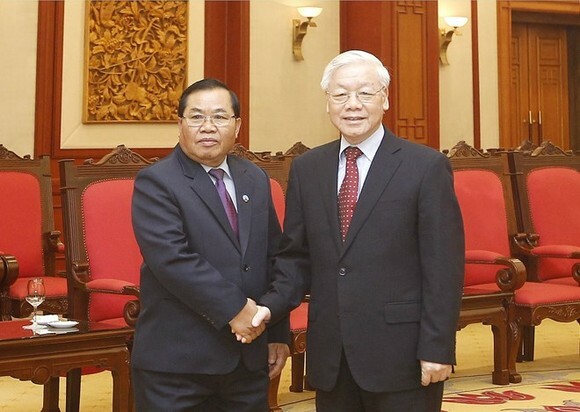 The Party leader also called on them to boost examining and promoting ministries, sectors and localities’ implementation of agreements between Vietnamese and Lao Parties, Governments and parliaments.